Looking for the best cheap kanthal wire or “vape wire”? Here are two great places to buy your vape wire, one is super cheap and one has authentic Kanthal wire at great prices. Lightning Vapes is the go to place if you want the cheapest vape coil wire available. The only downside to their wire is that it’s imported. I’m not saying that means it’s bad but it is what it is…. This is vape wire I usually use because it’s cheap but also made in the USA. It really doesn’t cost much more than imported wire for example 100 feet of 28 gauge wire only costs and extra 0.73 cents. It think it’s worth it because TEMco sells actual Kanthal wire and will have higher quality standards than an imported wire(see below). TEMco also is the company behind “VapeoWire” sold in many brick and mortar vape shops. Did you know Kanthal is actually a brand name for resistance wire like Kleenex to tissue paper? So most “Kanthal Wire” is actually a clone of authentic Kanthal wire. 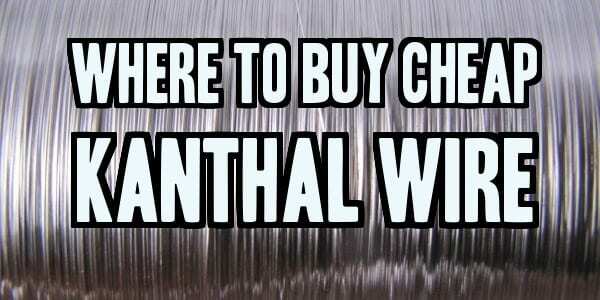 Kanthal wire is made from a mix of iron, chromium, and aluminum. The exact amount of each metal can vary and sometimes in none authentic Kanthal wire other metals are used. This is another reason I prefer buying my Kanthal from TEMco. But if you torch it too much it becomes brittle and snaps. I use cape supply out of California. I found them on Amazon and their prices are similar to the ones here. Thanks, I updated the prices. I’m not sure what your referring to. She’s looking for the insulators on premade tank coils. I’m french. So baught american’s wire is not cheap. A good adresse for us, European countries, is an English website. They make the different wires. They are very good, and have good qualities, choices, prices….and they listen the vape community. I wish I had known this before getting a spool of UD Kanthal. I try to buy US made when possible.